Through the science of Nd:YAG laser technology we offer a non invasive vein removal treatment for the removal of smaller vascular lesions including facial thread veins and leg veins (telangiectasias). A vein is a small blood vessel that sits near the surface of the skin. During vein removal treatment, laser light targets the blood that contains haemoglobin within the vessels. The haemoglobin absorbs the laser light emitted converting it into heat. This heat destroys the protein in wall of the vein vessel causing it to collapse and disperses the blood. The vessel is then reabsorbed naturally by the white blood cells with the body. An in-depth consultation with your thread vein removal specialist will be carried out to assess your personal needs before a treatment programme can proceed. This is followed with a patch test to determine skin response and the size of vessels before treating unwanted veins. 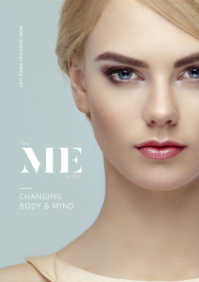 Thread veins can be unsightly and can affect self confidence but, through the use of Nd:YAG laser technology, treating unwanted veins on all parts of the body is possible. 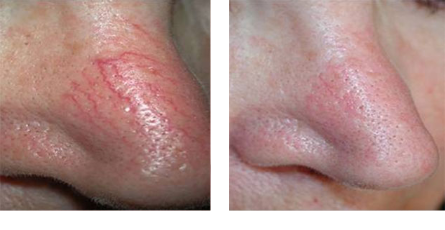 Superficial smaller veins in the facial, chest and leg areas are the most common veins to be removed by this technology. The technology is supported by worldwide clinical research studies with proven results for vein removal treatment. 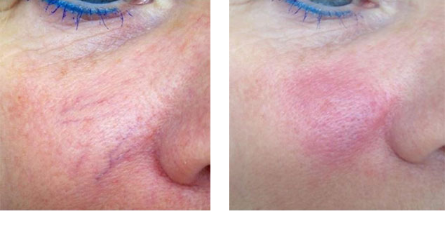 Vein removal treatment relies on the absorption on the laser beam into the haemoglobin within the blood to disperse the vein and is most effective on light skins. The lighter the skin the more pronounced the vein is which makes it easier to be treated. The darker or tanned skins will absorb more light, which makes treatment less effective. Recommended treatments of 1-4 treatments may be required one month apart; however this does depend on many factors depending on how many vessels that are to be treated and the area to be covered along with skin sensitivity. It is not possible to define how many treatments an individual will require, but treating unwanted veins is a straight forward procedure. When treating unwanted veins a hand piece is held above the vein and a beam of laser light is delivered to the individual vein. 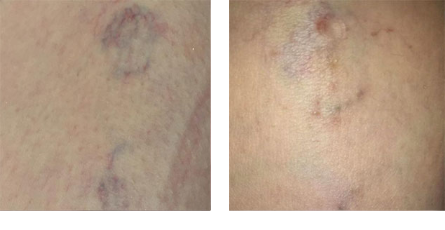 At the time of vein removal treatment and thereafter some veins will visibly disappear immediately, some become darker in colour, some fade gradually and can take up to a few weeks or more for the vein to disperse or lighten ready for further treatment. It is important to avoid tanning of the skin by solarium, sun or self tanning before and during Nd:YAG laser vein removal sessions. This is to ensure that the vessel absorbs the light for an effective treatment. It is advised not to smoke 2-4 hours prior to receiving this treatment as smoking can cause the vessels of the vein to constrict making the vein less available to treat. We also advise that post treatment an SPF sunscreen is used to the treated area(s), to limit sun exposure for a few weeks and compression (surgical stockings) should be worn for up two weeks after receiving vein removal treatment.